Abstract: Mineral assemblages in metabasites were used to estimate P-T conditions of pre-Alpine metamorphism in the Branisko and Cierna Hora Mountains which represent the easternmost exposure of the Tatric and Veporic Units. Garnet-pyroxene-bearing metabasites of the Branisko Mountains indicate high-grade metamorphism close to the boundary of amphibolite and eclogite facies conditions. They contain Ca- and Mg-rich garnet (Grs20–32, Py18–20), diopside and plagioclase (An10–40). Garnet contains inclusions of clinopyroxene, plagioclase, ilmenite and K-feldspar. P-T conditions of 732±24 °C and 1.26±0.12 GPa were estimated using various exchange thermometers and equilibrium reactions. Pyroxene forms symplectite with plagioclase and amphibole in the matrix. The high-grade metamorphism was followed by amphibolite facies metamorphism at 650 °C and 0.7–0.8 GPa. Lower temperature and pressure of 610±20 °C and 0.9±0.1 GPa for Variscan metamorphism were calculated from garnet amphibolites in the neighbouring Cierna Hora Mountains. Metamorphic conditions for Alpine metamorphism in the Cierna Hora Mountains were obtained using the mineral assemblages in Permian diorite of the Choc Nappe. They contain prehnite, pumpellyite, epidote, chlorite, albite and white mica, and yield temperature and pressure of 250±25 °C and 0.3±0.02 GPa. Abstract: The paper presents the complex geological structure and microstructure of four selected polydeformed shear zones within the granitoid core of the High Tatra Mountains. Sequences of deformation and mineralization were determined for each zone. In order to determine the deformation conditions, petrotectonic analysis and the chlorite geothermometer were applied. The obtained data were correlated with earlier published fluid inclusions investigations. Next, the results were supported by petrotectonic and structural analyses, and on the basis of the whole set of data three groups of structures were distinguished: 1 — pre-Alpine (connected with late Variscan extension or Early Jurassic rifting, brittle-plastic in character); 2 — Alpine (formed during the Late Cretaceous thrusting, marked by the presence of flat-dipping slickensided faults); 3 — late Tertiary (linked with the uplift of the Tatra massif and the accompanying extension and sinistral oblique-normal-slip faults). On the basis of the pressure 1.45–1.70 kba (145–170 MPa) and temperatures (212–254 °C) estimated from fluid inclusion analysis, as well as temperatures range of 205–250 °C obtained from the Cathelineau geothermometer, the depth of the granitoid massif position during the Late Cretaceous Alpine thrust folding was determined at 6–7 km and the geothermal gradient at ca. 30 °C. Abstract: The morphology and tectonics of the consolidated basement of the Carpathians has been analysed using magnetotelluric and deep seismic sounding. The results of these two methods allow for reconstruction of the depth of the consolidated basement in a similar manner. The magnetotelluric sounding has mainly been applied for the area of Poland and deep seismic sounding for the area of Slovakia and Ukraine. The products of the research are: the map of the depths of the consolidated basement, sketch of the main tectonic elements layout and numerous deep cross-sections. It has been stated that the morphology of the consolidated basement of the Carpathians is very variable. The depth of the top of the consolidated basement ranges from a few kilometers to ca. 24 km. The top surface of the basement dips from the north-west towards the east. It has the shape of a trough with the Tarnów–Putila axis. North and south of the trough axis the surface of the consolidated basement rises from a few to several kilometers at the Carpathian overthrust and the Pieniny Klippen Belt, respectively. The greatest drops are observed in eastern part of the studied region, in Ukraine, where the surface of the consolidated basement is at depths below 22 km. The axis of the largest depths of the consolidated basement from Rahiv to Krosno is regular and has a SE–NW orientation. Near Krosno, it bends southward to the Krynica region where it again reverts to the SE–NW orientation. The consolidated basement between the Dunajec and Tisa rivers has a blocky pattern and is dissected by numerous longitudinal and transverse dislocations. Along the transverse dislocation, this surface is systematically thrown in a south-eastern direction. The basement surface between the “regional basement slope” and the peri-Pieninian dislocation has a form of the trough with the axis Rahiv–Krynica. This graben is likely filled up with Paleozoic and Mesozoic deposits. It is believed that flysch units are rooted in this graben. Abstract: The 50–150 m thick Lower Triassic Luzna Formation quartzose sandstones and conglomerates are widespread in the Tatricum, Northern Veporicum/Fatricum and Zemplinicum (Western Carpathians). Several braided fluvial facies are well developed in the vertical sections from the Tribec Mountains, the Ciertaz Mountains and the Starohorske vrchy Hills. The channel lag and planar cross-bedded bar facies overlie major erosional surfaces and are characterized by complex interlayering of planar cross-beds 25–125 cm thick and trough cross-beds 15–50 cm thick. Paleocurrent data (both planar and trough cross-beds combined) indicate downcurrent, oblique or symmetrical accretion of the bars with respect to the local channel direction and are inferred to document lateral or mid-channel braid bar deposits. The thickness of the bar deposits suggests a shallow depth to the channels (~2 m). Paleohydrological data for mean and bankfull channel depth and width, mean annual discharge and mean annual bankfull discharge, paleoslope, drainage area and principal length of river are estimated. Paleoslope values estimated for the Luzna Formation braid-channels lie between those generally found for alluvial fans and modern rivers (mean S=0.0099). These higher paleoslopes, combined with shorter principal stream lengths, indicate a tectonically active, fault-segmented margin of the source area, from which were derived braided fluvial wedges of clastic sediments on the piedmont braid-plain. Abstract: The deep-sea, distal turbiditic deposits at Uzgrun have recorded no significant change of trace fossil diversity and ichnofabrics across the Cretaceous/Tertiary (K/T) boundary interval. There is no evidence of any ecological catastrophe that can be related to the K/T event. The trace fossil association is rather poor in diversity. This can be related to a general oligotrophy and poor preservation potential. The producers of the discussed trace fossils, dominated by Chondrites intricatus (Brongniart), Chondrites targionii (Brongniart), Ophiomorpha annulata (Ksiażkiewicz), Ophiomorpha rudis (Ksiażkiewicz), Palaeophycus tubularis Hall, Planolites isp., Phycosiphon incertum Fischer-Ooster, Thalassinoides isp. and Trichichnus isp. lived in a habitat, which had not been influenced by the event. Abstract: The Călimani Mountains represent the largest and most complex volcanic structure at the northern part of the Călimani–Gurghiu–Harghita range in Romania. Sixty-eight K-Ar ages (thirty-three new) provide constraints on the eruptive history of the Călimani volcanic structure between 11.3 and 6.7 Ma. The oldest rocks are from shallow exhumed intrusions, which pierced the basement between 11.3–9.4 Ma. The oldest stratovolcano was centered on the presently recognizable main volcanoes, Rusca-Tihu and the Călimani Caldera and grew very large (ca. 300 km3), generating a large-volume (26 km3) debris avalanche. Debris avalanche blocks dated between 10.2–7.8 Ma, suggest an edifice failure event at 8.0±0.5 Ma. The Drăgoiasa Formation (9.3–8.4 Ma), Budacu Formation (9.0–8.5 Ma), Lomas Formation (8.6 Ma), a number of Peripheral Domes (8.7–7.1 Ma) and Sărmas basalts (8.5–8.3 Ma) were also active before the debris avalanche event. Volcanic activity continued from the Rusca-Tihu Volcano between 8.0–6.9 Ma, generating the “Rusca-Tihu Volcaniclastic Formation”. The Călimani Caldera structure including pre-caldera and post-caldera stages was generated between 7.5–6.7 Ma, with an inferred collapse event at 7.1±0.5 Ma. Monzodioritic-dioritic bodies in the central part of the caldera show ages between 8.8–7.3 Ma, implying several episodes of intrusions. Fractional crystallization was important in the generation of different magma series at lower crustal to shallow crustal depths, where plagioclase was the main crystallizing phase. Crustal assimilation affected most of the analysed samples to some degree through assimilation-fractional-crystallization (AFC) processes. Isotopic enrichment of the most basic rocks suggests that contamination processes affected the source of most parental magmas, except those of the Lomas Formation. The initial stages of volcanism were most complex from the petrological point of view. The Drăgoiasa Formation (represented only by felsic rocks), for instance, suggests either fractionation from a basic parental magma and mixing with partial melts of (lower) crustal origin, or represents direct melting of the garnet bearing lower crust. The Lomas Formation represents the most primitive magma, which reached the surface recording minimal interaction with crustal material and most closely characterizes the isotopic composition of the mantle source beneath the Călimani Volcano. The youngest volcanic rocks represented by the Călimani Caldera structure were derived from magmas that show a lower degree of partial melting and were largely affected by assimilation processes. 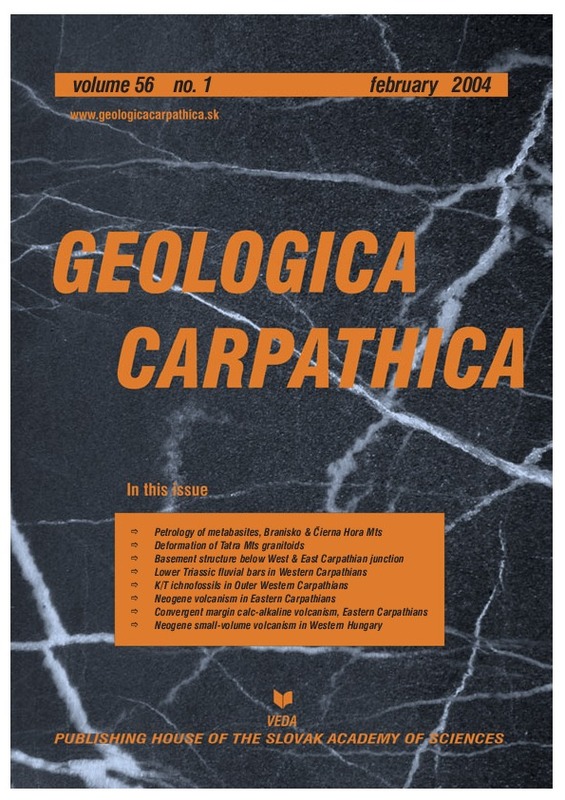 Abstract: Neogene calc-alkaline magmatites (from basaltic andesites to rhyolites including mafic cognate enclaves) of the Rodna-Bârgău subvolcanic area (East Carpathian arc) are evaluated on the basis of new mineral compositional data, major and trace elements, as well as Sr and O isotope data. Two different series of rocks have been separated. The magmas of the medium-K series had a rapid ascent toward the surface, as proven by the presence of primary garnet bearing rocks, or by the sporadic occurrence of mafic cognate enclaves. The δ18O values of amphiboles vary from 4.2 to 5.4 ‰ (SMOW). The δ18O value measured on garnet is 4.3 ‰. The range of 87Sr/86Sr ratios is from 0.70588 to 0.70887. The decrease of the δ18O values as 87Sr/86Sr ratios and SiO2 increase is interpreted as a progressive contamination of a mantle derived magma with a contaminant depleted in δ18O and enriched in 87Sr/86Sr (i.e. hydrothermally altered lower crustal rocks). Within the high-K series the presence of intermediate magma chambers where assimilation-fractional crystallization processes took place is considered. The δ18O values measured on clinopyroxenes vary from 4.6 to 5.7 ‰ and on amphiboles from 3.8 to 6.7 ‰. The range of 87Sr/86Sr ratios is from 0.70605 to 0.70950. The covariation of the δ18O values and 87Sr/86Sr ratios is scattered. The highest δ18O values correspond to the highest 87Sr/86Sr ratios and are consistent with assimilation of the local upper-crustal rocks. The lower δ18O values and the observed oxygen isotope disequilibrium between coexisting pyroxenes and amphiboles are explained by interaction with heated meteoric water. Abstract: The Tihany Maar Volcanic Complex (TMVC) consists of several eruptive centres and is made up mostly of pyroclastic rocks. It belongs to the Bakony-Balaton Highland Volcanic Field (BBHVF), which is an extensive Late Miocene–Pliocene alkaline basaltic volcanic field in Western Hungary. The TMVC is the only known location in the BBHVF where volcanic rocks are in a stratigraphically fixed position near the boundary of the Congeria balatonica–Prosodacnomya Zones. Since 1985 this stratigraphic importance motivated repeated efforts to obtain unquestionable radiometric data with sufficient accuracy for the volcanic phases. Due to the difficulties of dating basaltic pyroclastic rocks (detrital contamination, excess argon, argon loss during hydrothermal alteration, high atmospheric argon content, etc. ), this is for the first time a fully acceptable age of 7.92±0.22 Ma has been obtained for the onset of volcanic activity of the TMVC at the location Monk’s cave. This age is a key datum for the boundary of Congeria balatonica–Prosodacnomya Zones and it agrees well with the start of alkali basaltic volcanic activity in Central Slovakia. 7.35±0.45 Ma is obtained for Dióstető. The youngest ages, showing the greatest argon loss were measured for the location Gödrös. An analysis of the isochron diagrams suggests here an interval from 6.24±0.73 Ma to 5.92±0.41 Ma for the time of volcanic activity. This age sequence is in agreement with volcanological field observation and in spite of some uncertainty of the younger age limit, it is indicated that volcanism at Tihany was not a single event of the same volcano, but rather a result of longer lived eruptions from a closely spaced, nested volcanic system.